Eugene Cyril Smith III was born on the 10th October 1990, in Miami, Florida USA, of African and American descent. He is known for being a professional American Football player, in the position of quarterback for the New York Jets team in the National Football League (NFL). Previously, he was a player in the college team at West Virginia. So, his professional playing career has been active since the 2013 and the NFL Draft. Have you ever wondered how rich Geno Smith is, as of mid- 2016? It has been estimated from authoritative sources that the total size of Geno’s net worth is as high as $2 million. He has been accumulating his net worth through his successful involvement in the sports industry as a professional football player. Geno Smith was raised with his younger brother by parents Eugene Smith, Jr. and Tracy Seller. He attended Miramar High School, where his amateur career in football began. He excelled in playing football, and he finished his junior year with 2,200 yards, 25 touchdowns and he was named the Second Team All-State QB. Thanks to his skills, Geno was invited to join the prestigious Elite 11 Quarterback Camp in Aliso Viejo, California, and as a senior he was named All-State First Team as well as Parade All-American, as he led his team to the state 6A semi-finals. Furthermore, he finished his high school football career as the 3rd best passer in Borward County history. After matriculation, he decided to study at West Virginia, although he was offered a scholarship by a number of colleges. He played football for West Virginia from 2009 until 2012, after which he entered the NFL Draft. During his college career, Geno became one of the best quarterbacks in the college’s history, and won several awards and recognitions, including the Orange Bowl MVP, and he was also named into the First-team All- East in 2011, All-Big East Conference Second Team in 2010, and All-Big East Conference First Team in 2011. 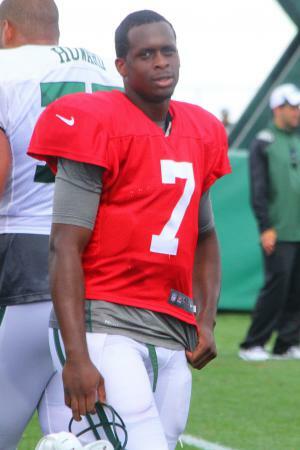 Geno`s professional career began in 2013, when he was selected as the 39th pick by the New York Jets, and signed a contract worth $5 million over four years. In his first season, Geno was the starting quarterback, and recorded 3,046 yards, 12 touchdowns and 21 interceptions. In his second season, his numbers declined a bit, as he played in 14 games, starting in 13, recording 2,525 passing yards, 13 touchdowns, and 13 interceptions. For the 2015 season, Geno played in one game only, after he and his teammate IK Enemkpali fought each other, and Geno ended with a broken jaw. He underwent surgery, and missed the rest of the season. IK Enemkpali was released by the club. Speaking about his personal life, there is no information about it in the media, apart from the fact that he regards himself as a Christian, and is also a big fan of the Canadian rock band Nickelback. Geno Smith is very active on social networks, such as Twitter, where he has a great number of followers. 1 Punched out by Ik Enemkpali during a locker-room altercation, breaking Smith's jaw in two places. Smith had to undergo surgery and will be out 6-10 weeks. According to the August 16th New York Times, Smith's friend was in an accident the day Smith was to appear for a children's football clinic Enemkpali was hosting. Smith did not tell Enemkpali he would not be at the clinic nor had he reimbursed Enemkpali the $600 Enemkpali paid for Smith's plane tickets and limo. The day after Enemkpali was released by the Jets, he was claimed by the Buffalo Bills whose head coach, Rex Ryan, had drafted him. [August 11, 2015]. 2 QB drafted by the New York Jets in the 2nd round (39th overall) of the 2013 NFL Draft out of West Virginia.